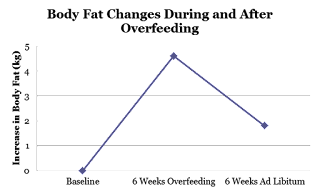 The 'body fat setpoint' is a theory based on observations that: (1) people and other animals maintain a fairly constant weight despite not counting calories and day-to-day variations in calorie intake and expenditure; and (2) after periods of overfeeding or underfeeding people will return to roughly their previous weight (see next section). This is also why wild animals and hunter-gatherers pretty much remain lean all year round and is another refutation of the thrifty gene hypothesis. It’s normal for this system to work. Examples of this system not working are mice with a genetic mutation where they can’t produce leptin (ob/ob) and mice with nother genetic mutation where they don’t have leptin receptors (db/db). 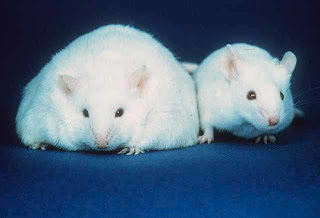 Both of these mice are very obese. But these mutations are extremely rare. 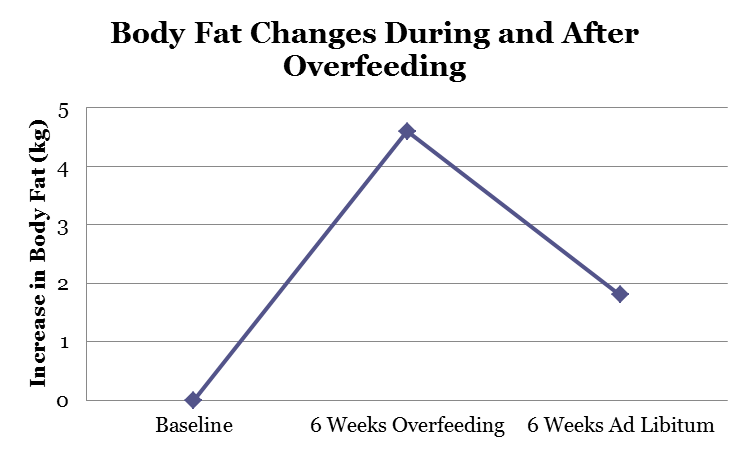 Most human obesity isn't caused by these mutations and is characterised by very high leptin levels (due to having lots of body fat) and a lack of significant weight loss in response to leptin administration. 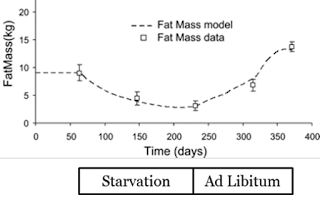 This suggests that the defect in most human obesity in leptin resistance (LR) (analagous to insulin resistance) . When mice are fattened through diet induced obesity (DIO)* mechanisms of leptin resistance, such as various signals that inhibit the signal transduction of leptin , inflammation  and apoptosis  of hypothalamic neurons, occurs before obesity, suggesting leptin resistance causes obesity, but also maintains obesity. 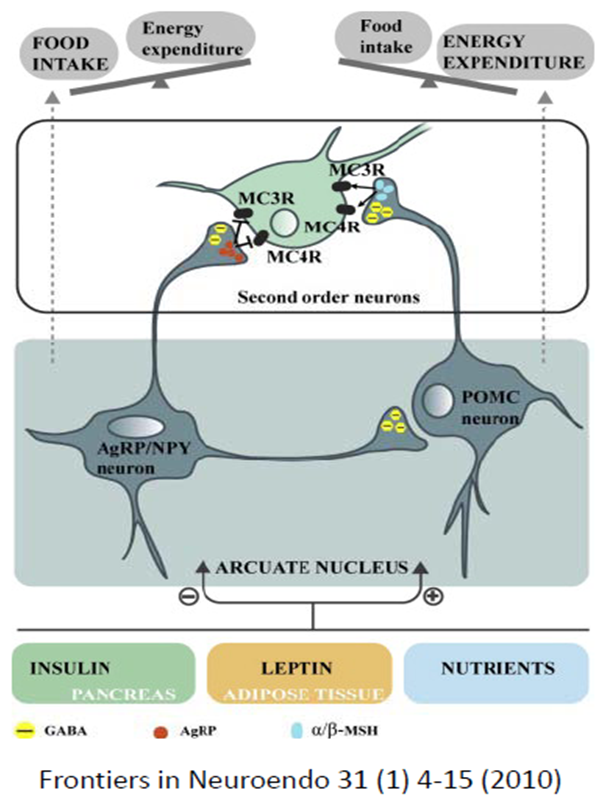 So then, what causes leptin resistance? * Obesity researchers need a way of inducing obesity in animals quickly and reliably. Many studies use a special diet called ‘high fat diet’ or ‘HFD’, which is high in fat but made from refined ingredients. They use it because mice/rats consistently eat many more calories on this diet . Note the difference between ‘high fat diet’ (a name) and ‘a high fat diet’ (a description of a diet that can be generalised). There’s enough evidence to suggest humans can lose weight on high fat diets and another way of explaining HFD is ‘diet induced obesity’ (DIO), so I’ll use DIO instead of HFD.